Bring Me Back is the third book written by B.A. Paris and having loved the first two imagine my excitement when I saw that this one would be coming soon. Immediately my little fingers pound down on that request button to obtain a review copy then I had to sit back and wait….. But then the excitement level was tested as I waited until closer to publication to read this one. I kept seeing review after review that just seemed to have a mediocre feel to them all. I kept hoping though that I would be the one oddball that absolutely loved it anyway no matter what anyone else had thought. Unfortunately, it didn’t happen. 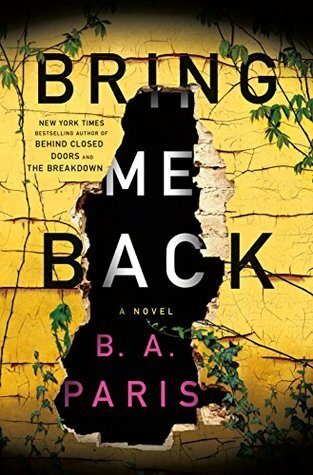 Much to my dismay I never really got excited for Bring Me Back at all once I began to read the story. The book started off with Finn and Layla stopping so Finn could run into the restroom only for him to return to find Layla missing after which he goes to the police but years pass with no sign of Layla or hint to what happened that night. Twelve years later we join Finn as he is happily in a new relationship with Ellen who just happens to be Layla’s sister. The pair are newly engaged when out of nowhere suddenly signs of Layla being alive and well start popping up into their lives so what is Finn to do when the love of his life is back and he doesn’t have to settle for second best? The story is told by switching from the now to the before to alternate giving readers a look into Finn and Ellen’s lives as the first hints of Layla’s return are happening and a look back at Finn’s relationship in the past. Now for me I’m one that sees a person has been gone for over a decade and I just can’t get overly excited. So I get an early theory into my mind and plod on with the story. I was also not a happy camper that Finn’s whole moving on and starting a new life just happened to be with the sister of the missing girlfriend so that also added to my meh feeling and lack of excitement. I kept hoping upon hope though that some magical moment would come and there would be a major twist to snap me into that frantic need to know mode I get into but it just wasn’t coming. At the end of the story I found that part of my early intuition was partially correct so this one just turned into one of the “meh” it was alright but forgettable ones to me. I have high hopes that the next will be much better again and will be right back in the line to grab it though. B.A. 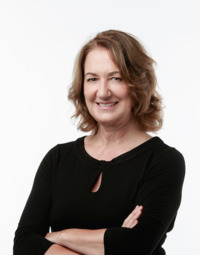 PARIS is the internationally bestselling author of Behind Closed Doors and The Breakdown. She grew up in England but has spent most of her adult life in France. She has worked both in finance and as a teacher and has five daughters. Bring Me Back is her third novel. I had a few similar issues with this one. I loved the first two books as well. I did think the ending was really good. I hope your next read is a fantastic one! Thanks Diana! I will definitely still be excited for the next even with being a bit disappointed with this one. Maybe you’ll get a bit more our of it than I did, although it seems to be one that’s a bit meh to a lot of fans. I am in the same boat Carrie. I have been reading lots of reviews that are just okay and not what I expected. I will see as it is up in the next week or so. Honestly I hope it works out better for you but after finishing I really understood why most of what I was seeing was around 3 stars. I have a feeling, it will be the same. Unfortunately that’s what happened to me, I was sure I would love it regardless of everyone else.